In a small bowl, whisk the vinegar, ginger, garlic, sugar, olive oil and 2 Tbsp Mint. Season with salt and pepper. 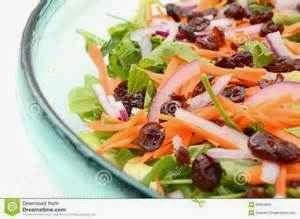 In a large bowl, toss carrots, red onion, cranberries, scallions, cilantro and remaining 1/4 cup of mint leaves. Pour the dressing over the salad, tossing well, then marinating at room temperature for about 1 hour, stirring occasionally to allow the flavors to develop. If you enjoy a little heat, add some diced jalapenos or red pepper flakes.